Pacific bottlenosed dolphins riding bow waves is a common sight. Dolphins also ride ocean swells and the wakes of large whales. All that riding starts young. Mother dolphins can't carry their babies, so the little ones swim easy in their mother dolphin's slip stream. 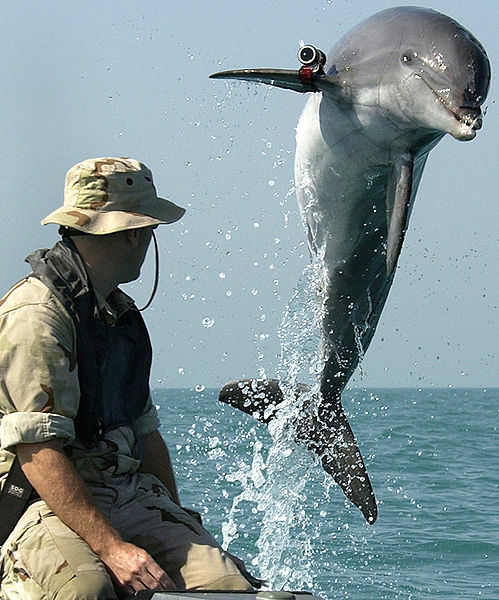 K-Dog, a bottle-nose dolphin leaps out of the water in front Sgt. Andrew Garrett while training near the USS Gunston Hall (LSD 44) in the Arabian Gulf.